The third Xbase++ 2.0 Community Technology Preview has just gone online. All of the announced features and enhancements have made it into this preview build and are ready for testing. With the beginning of the new year, we will address the known issues which came up during final testing with a refresh. We are also planning for an aggressive refresh schedule afterwards. Although our offices are closed until January 4th., we will provide limited support for urgent preview-related issues which come up between the years. Please direct your enquiries to the Xbase++ 2.0 preview newsgroup which will be monitored for this purpose. In order to download the Xbase++ CTP3 build, please log into your customer account and go to Downloads->Community Previews. As announced earlier, CTP3 is available for all customers with an active subscription and customers which have purchased Xbase++ in the last 12 months. Finally, we would like to take this opportunity to thank all our partners and customers for their dedication and continued support. A special - thank you - goes to the organizers and attendees of the three (!) Xbase++ developers conferences that took place throughout the year. Much of your valuable feedback went directly into the preview build! A nice Christmas and a happy and successful new year to all of you! Right now, the development team at Alaska Software is working hard to ensure that the next community technology preview (CTP3) is available for download before Christmas. This means that with the start of the new year, we will begin the final run towards the release of Xbase++ 2.0. We want to move forward with an agressive refresh schedule, like we did with the CXP CTPs. According to our current plans, there will be no CTP4. 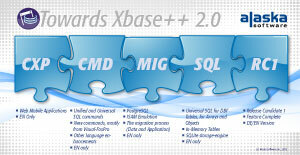 Instead, we intend the release candidate of Xbase++ 2.0 to be ready around Q1/Q2 2013. The following is a list of the most outstanding features included in CTP3. Universal SQL support: SQL for PostgreSQL, Advantage Database Server, dbf tables, objects and arrays. PostgreSQL ISAM upsizing support: existing dbf/ntx/cdx-based applications become PostgreSQL client/server solutions with only a few code changes. Object prototyping and DataObjects as the new way to transport your data between the application layers. WebSocketHandler and WebHandler: create a websocket server with only a few lines of code, push data in real time between workstations or to the browser. WebUI for windows: create views with HTML and CSS for your Win32 desktop applications. CXP build and execution infrastructure: create web or connected mobile applications. Xbase++ Workench, formerly known as Visual Xbase++ IDE. New data model for the sample collection. Available as dbf tables, Visual FoxPro database, Advantage Database Server dictionary, PostgreSQL database and SQLite database. While previous CTPs had been made available for download to everybody, the CTP3 and the release candidate will be made available only to active subscription customers and customers which have purchased Xbase++ in the last 12 months. The session material as presented by Alaska Software on the 4th European Xbase++ developers conference has gone online. This includes the session slides along with supplemental material. In order to download the supplemental session material, please log into your customer account and go to Downloads -> Documents. There you will find a zip archive with around 45MB of samples, data and additional information . 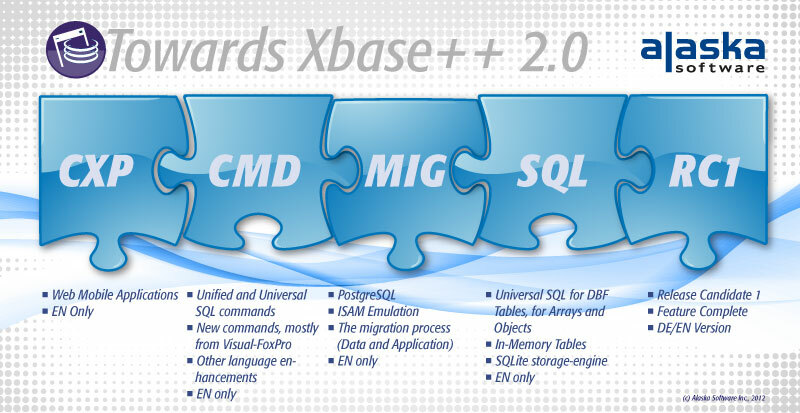 Most of the topics of the European Xbase++ conference covered features of the upcoming Xbase++ 2.0 release and their respective usage. The conference material hence is a good starting point for everybody to get an idea about what's new in 2.0! Because these topics are of such a great importance to any Xbase++ developer, we decided to publish the raw session video feed in our new YouTube channel. Remember that being cut from live capture, the videos can not reflect all the information given in the sessions. Neither can they capture the atmosphere of this great event. So don't miss out on the opportunity to participate at Southwest Xbase++ 2012 , the next Xbase++ conference to be held in the US in October this year! The session details of the Xbase++ developers conference to be held in Arizona, USA, on October 18th 2012 are now online . This conference is centered around the practical application of new features available with Xbase++ 2.0. How can I benefit from Universal SQL in may daily work? How can I efficiently modernize my existing dbf/ntx/cdx-based application by making use of the PostgreSQL server? How to add modern web technologies to my existing Xbase++ solutions to make these available on non-Windows devices like tablet computers or smart phones? These and various other questions will be addressed in great detail. More details about the sessions at Southwest Xbase++ 2012 and the available conference tracks can be found here. But don't wait too long to get yourself registered! Attendees sending in their reservations ahead of time will be rewarded with early-bird discounts and other benefits. More information and the registration form is located here . Still not sure if you should attend? Still got any questions? Drop us an email ! Announcements and latest news about the conference are posted on Twitter. Follow us @swxbase . 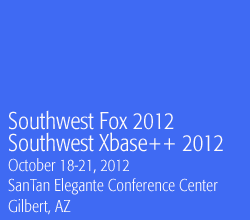 Alaska Software announces the Southwest Xbase++ Conference to be held on October 18th - 21st, 2012 in Gilbert, Arizona, USA. Alaska Software has reached an agreement with the organizers of the Southwest Fox conference to reorganize this long-standing event to become a dual FoxPro and Xbase++ conference this year and in the years to come. Therefore, mark the date as this will be the place to be to get the latest knowledge and training on Xbase++ 2.0 and beyond! According to Steffen F. Pirsig, chief architect of Alaska Software, "This new joint conference is a great opportunity for both communities, Xbase++ developers and FoxPro developers alike, to learn from each other and to move forward to a common future." More details about the conference sessions and conference registration will be announced soon! Refresh 4 of the Xbase++ 2.0 <CXP/> CTP1 has just gone online. This fourth refresh delivers new features and enhancements, including support for using layouts, sections and pagelets. In addition, various fixes, new samples, refactored classes and further additions to the documentation of the <CXP/> execution infrastructure are included in this release. Last but not least, this CTP comes with a version of the Visual Xbase++ IDE that has been enhanced for <CXP/> development. Please consult the "Changes" section in the documentation to learn more about the changes made for this CTP. Also consult the README included in the zip file for last minute changes. This release concludes CTP1 with its <CXP/>-related featureset of Xbase++ 2.0. Beginning with the next CTP, the focus will be put on the Arctica/SQL-specific features. Development is right now in the process of merging the <CXP/> and Arctica feature branches of the code repository of Xbase++ 2.0. Packages available: This release is provided as a zip file containing two installation packages. Choose cxpctp1_iis7.msi to install the <CXP/> technology for the IIS7 web server, or choose the installation package cxpctp1_apache.msi if you are using a Apache 2.2 web server. Download: Existing customers can go straight to www.alaska-software.com -> login -> downloads -> previews, and download CTP1. Non-Alaska Software customers and Visual FoxPro developers first need to create an account to access the download area. Should I attend the 4th European Xbase++ conference? When will Xbase 2.0 become available? When can I begin migrating my application to SQL? These are typical questions from the Xbase++ community. Although it's a policy at Alaska Software to not publish specific release dates, nonetheless we would like to take the opportunity to address those questions. When can I begin using Arctica/SQL? Many of the Xbase++ developers asking themselves this question are looking for a quick and easy transition to SQL, be it due to customer demand, the need for better performance or just the desire to follow the current "mainstream". Xbase++ and Arctica will make available a host of SQL-related technologies, which will ease the transition to and the usage of SQL. However, in addition to the obvious topics involved (new SQL command, etc. ), there is a number of additional factors that must be taken into account during the transition. To what extend will application performance be affected? What will my backup procedure look like? How will my application be installed and what kind of infrastructural demands will I be facing when using a PostgreSQL server? All of these questions will be answered at the 4th European Xbase++ conference. A database workshop will specifically address the issue of which data access and data management concepts should be used under which conditions. When will Xbase++ become available? Individual technologies of the Xbase++ 2.0 product will be made available as part of a community technology preview (CPT). The next CTP refresh will be the last to deal with the <CXP/> technology. New features, such as layout management, pagelets, additional examples for file upload and mobile order reservation are just a few of the topics covered. Next in line is the CMD CTP, which will include the new SQL commands as well as the commands borrowed from Visual FoxPro, such as SCAN/ENDSCAN. The MIG CTP, which will follow afterwards, will put the focus on transforming your DBF/NTX/CDX-based application into a PostgreSQL-based one. Finally, the last preview will address topics such as SQL in conjunction with DBF tables, virtual (in-memory) tables and mobile databases with SQLite. There still is quite some work ahead of us. For you as an Xbase++ developer, the goal should be to keep yourself informed about all of these subjects. For this reason, you should attend the 4th European Xbase++ conference, because this is where you will get a comprehensive introduction into these various subjects and technologies. Important: The primary language of the Hannover conference will be German! Some sessions will be held twice (German and English). For more details see the session plan here. Finally, there will be a US conference this year - more details will be announced in due course.